Build a relation based private GDS, take more control and enjoy zero acquisition cost on your Agent & Corporate bookings. 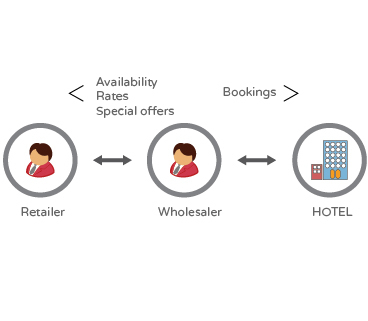 Integrates Hotels, Liveaboards and Activities with Wholesalers and their Retailers (B2B2B). Connect to your existing partners and easily discover new partners who are on the Openhotelier Marketplace. Sign up new partners via e-contracts and assign market specific wholesale nett rates. Openhotelier has partnered with industry leading fintech companies to automate the payment process, eliminate heavy bank fees and enjoy mid-market exchange rates. Wallet based transactions allowing Partners to instantly pay the hotel invoices. 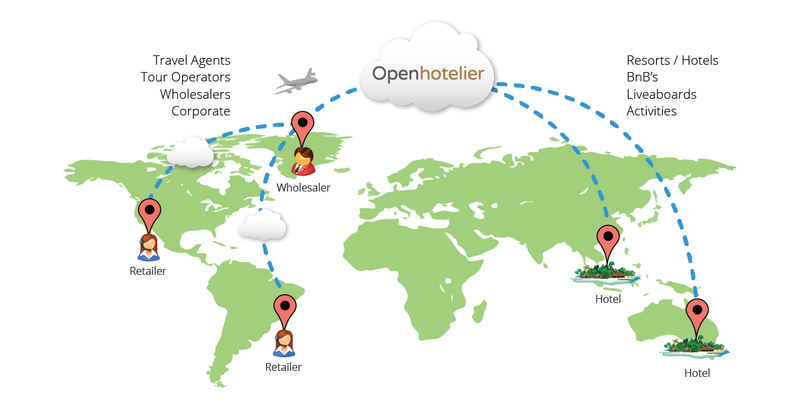 "Openhotelier is a comprehensive B2B solution for managing hundreds of agents from one location. This easy to use tool has made us manage our agents/clients more dynamically and we recommend this to all." 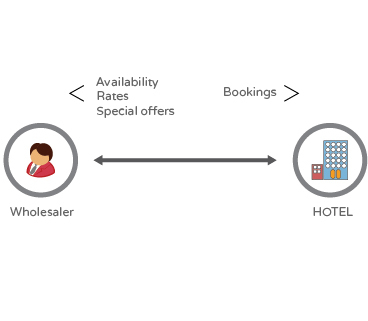 " Openhotelier, is making managing multitude of booking channels so much easier and with the B2B component Openhotelier offers a complete product. Combined with great customer care and an easy to navigate interface, I would recommend Openhotelier to everyone." "Thanks to the Openhotelier team, this innovative new generation of B2B Reservation system is easy to use, cost effective in many ways and efficient. Very useful for R&D purposes in today’s marketing. We are using Openhotelier and its great." "As a small guesthouse, Holiday Home Kelaa experienced difficulties to manage our bookings. Hence we started using Openhotelier Guesthouse Manager. The system is doing an excellent job now. So we recommend Openhotelier as an excellent booking system for small hotels and guesthouses." Accessible anytime anywhere, and never worry about losing your data. Retrieving payments from your customers is much easier with the Openhotelier BSP service. Fetch rates from your partner hotels, add your markup and redistribute to your subagent. JSON/XML API to pull availability, rates, offers and push bookings. B2B Travel Management Systems can easily connect with us. Confirm, Amend and Cancel your bookings instantly and avoid losing your clients to OTA’s. Create as many users as you like for your staff and set restrictions to different users. Load simple to complex offers along with market restrictions and make it visible on instant quotes. Raise proforma or tax invoices and automatically send them to your partners. Reports and statements. Openhotelier Partner Manager is an online distribution model developed to network Hotels with their Tour operators and Coporate partners. Partner Manager can be considered as your private GDS, giving you more control and costing you much less. Typical GDS fees can vary between USD 10 to 15 per booking. If your Average length of stay is 3 to 4 nights, selling via Partner Manager is costing you 3 or more times less. Along with GDS bookings, there are many Travel Agents and Corporate customers booking via OTA's. You are losing the high commission on these bookings along with credit card charges. It's now possible to let them source directly, enabling them to enjoy a better rate, service and settle the payment via our BSP. Openhotelier Guesthouse Manager is a low cost, lite PMS developed specifically for small hotels and guesthouses. Includes a Channel Manager connecting with leading OTA’s such as Booking.com, Agoda and Expedia. Fully fledged travel management system to automate all your back office tour operator functions including redistribution to your sub-agents. Manage all your bookings, rates, special offers and tour packages on the cloud with built in invoicing, finance management and reporting. Various types of graphs can be generated to monitor performance of individual clients or subagents. We have designed a system that is both user friendly and powerful which any tour operator can setup in single a day and immediately start making bookings. 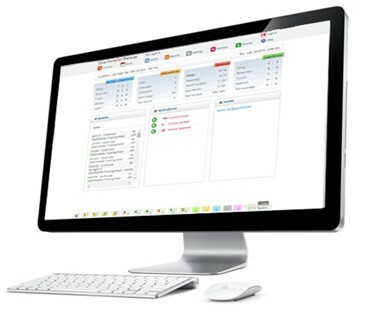 The travel management system is connected to the hotels inventories via their channel manager or inventory can be managed directly by the hotels via the partner manager. FREE forever for licensed Tour Operators. Connect to your partner hotels to access real-time availability and nett rates along with instant quotes. 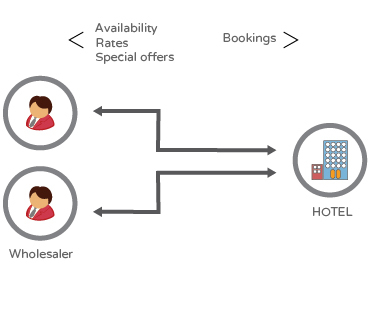 Fully automate all back office functions of a Tour Operator with access to real-time availability from hotels. Openhotelier Liveaboard Manager is a full fledged platform to entirely manage all your distribution and opening up the possibility of selling via large OTA's like Booking.com etc. Instead of entirely being dependant on charter operators, Vessels can now open up their sales globally via our B2B2B Partner Manager.